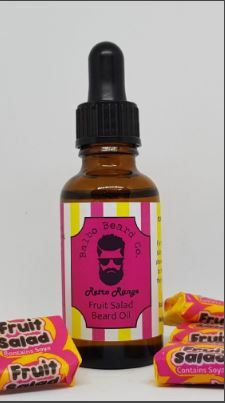 The Balbo Beard Co Fruit Salad Beard Oil is one of the oils from the recently added Retro Sweets Range. Up until now the owner and creator of Balbo Beard Co has worked with only essential oils but I really like the addition of these oils and I think they will prove to be very popular. These are of course all scents that we will recognise from our childhood back when all the sweet shops sold many of the sweets loose and we could ask for 10p of our favourite sweets. The Fruit Sald=ad scent is spot on and whilst it is a good scent, it isn’t want that excites me like the Lemon Sherbet scent did, but as I said, it is a very nice scent. The base for this oil is a blend of Grapeseed, Jojoba and Argan carrier oils and from the minute you dispense some into your hand, you can feel the quality of this oil. It leaves my beard feeling soft and looking healthy and I as always highly recommend the Balbo Beard Co oils. The Balbo Beard Co Fruit Salad Beard Oil comes in a 30ml glass bottle with a glass dispenser and costs £9.99 from the website. ← Slipping back into depression!